Get hundreds of messages for daily guidance from your Spirit Guides! 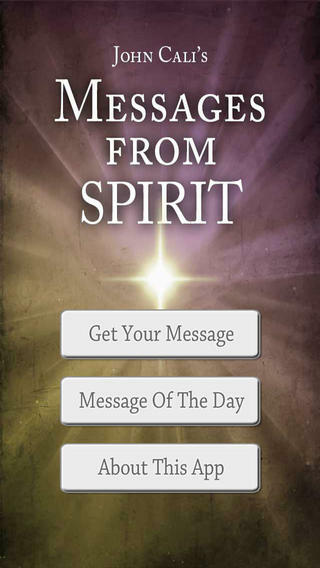 Our previous app, Spirit Oracle Cards, is already very popular, and we think you’ll also love this new one. It contains hundreds of messages, given to John Cali by his spirit guides over the years. You can use any of these messages for whatever reason you wish, and share them with your friends and family. They are particularly powerful in helping you with the daily issues and challenges we all face. As you know, your spirit guides are always tuned in to you, and whatever messages you pick will be perfect for you at that moment. You’ll be amazed at the synchronicity of the process—you’ll get the exact message you need for the issues you’re experiencing today. Before you draw your message, get into a quiet, meditative state. Take a few deep breaths to relax your body and mind. Then begin. You can, for example, ask a question and then draw a message. Or you can pick a topic you want a message on. Or simply be open to whatever message your spirit guides want to give you. Then draw your message. As you know, there are no “coincidences” or “accidents.” The messages you draw will be perfect for you because your spirit guides are always tuned in to you. Trust them to deliver the exact message you need to hear at that moment. Think of this as your own private access to your spirit guides any time you want their guidance. Approach the process playfully, joyfully—as you would a game. Except this is the game of life. Games are supposed to be fun. Life is supposed to be fun. So engage your soul, your spirit guides and their messages with the clear intent to more deeply know and love yourself and your life. These messages will serve to remind you who you really are—God in human form, with all the power that goes with being divine. For many years a non-physical group of spirit guides, known simply as “Spirit”, have offered their wisdom and guidance for living a life filled with love and joy. Channelled by John Cali, Spirit’s messages remind us we are powerful creators, divine beings in human form. We have the power and wisdom to make a positive difference in our world, in the lives of others, and in our own lives. Very nice app Works very well and delivers good messages. Doesn’t nag to upgrade to paid and free option is still good. Would like it if app could be viewed in landscape mode but that’s a minor niggle really. Love it I like the graphics with the stars. I find myself anxiously anticipating the message to come. So far all messages have been a source of inspiration. Well done Decent presentation of a quote randomizer. I’ve downloaded a few but this is the only one I bought. Clean, pleasant interface makes this a nice app to spend a quiet moment with from time to time. Pretty Awesome All in all it’s pretty fun and always helps me make my mind up when I’m debating things and need some extra guidance. Fabulous! Messages are direct and clear as if talking with a trusted friend who knows you well. The app itself is smooth and easy to navigate.